One of the GFG's I saw on here has inspired me to go for it. I've used the tutorials to get the first row done, but I can't find anything on how to attach the next row. And for how to attach them to each other for that matter. It's probably one of those things that when I get to that point it'll be a 'duh' moment, but I always like to get a visual when I can. Anyone have any tutorials out there that I'm just not finding for some reason? I start with the center of the flower and add each petal, expanding out until I have my block complete. 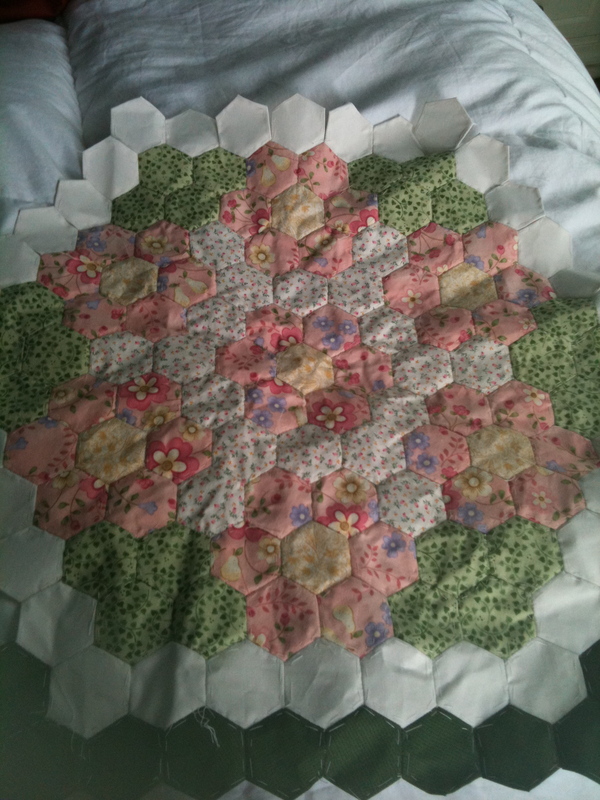 I'll add a photo to show my big blocks - each block is made up of 6 flowers. So after the first six are attached, do you just go (I'm looking at the green and white border) from white to green, white to green (at the Y) then the green to green? In this case, I think Karen just went around the whole block with the white, then around that with the dark green. When putting the blocks together, you just hold them right sides together and procede to whipe stitch. (or what ever stitch you are using) Good luck on your GFG adventure! Karen, your GFG block is beautiful. I love the color choices you have made.